A few weeks ago I shared a picture of some fairies that I was making from oven bake clay. These are made from a mold. 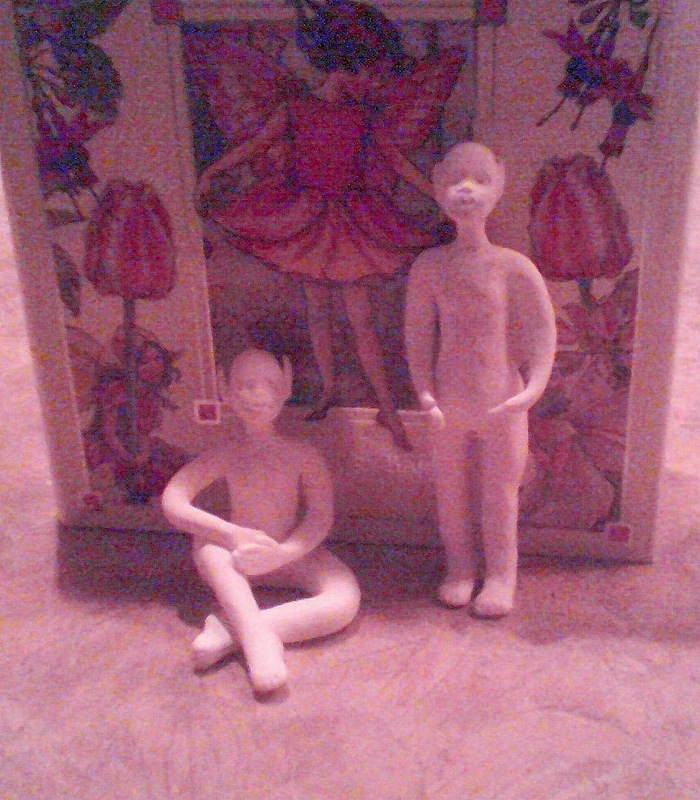 If you have ever make ceramic figures before making figurines from clay is nothing like it. It's not at all like cleaning seams and then having it fired before painting it. That being said I hope that you'll forgive my little gargoyle looking fairies. I've grown to accept them for what they are and have even become quite fond of them. This is my fairy twins shortly after they came out of the oven. These are my twins after they were painted. Those little features were really hard to paint. I gave them blue eyes at first only to realize that it made them look spooky. So I changed them to dark green. I am making their wigs out of HomeSpun yarn. Her hair is really long. I might cut it shorter or not. I just don't know yet. After allowing the pieces to dry I trimmed off the excess glue. Then starting at the base of the head I started gluing each piece in place. Funny how long it took to make their hair. I do think that it was worth the time that I invested in it. I'm quite happy the way their hair turned out. I will from time to time share my progress with you. Stay tuned there is more yet to come!!! these are just delightful - I look forward to seeing how they progress! Thanks. I'm not quite sure how to give them wings. Right now it seems a major stumbling block. Fabric? Paper? use 'angel hair' ...you iron it between two sheets of greaseproof paper and it melts the fibres into a shiny weblike paper. Thanks. I've thought of both of those. These are my paper thoughts. They both will make beautiful wings but I've used them for wings before. I want something a little more long lasting. I do leaded glass and thought about making glass wings...but they would be too heavy. I'm going to try clear plastic packaging and glossy accents. I don't know if it will work but I'm going for it.